Wavetek 178 Compatible Waveform Generator - GP1665W | Marvin Test Solutions, Inc. The GP1665W is a direct drop-in replacement solution for the obsolete Wavetek 178 waveform synthesizer. 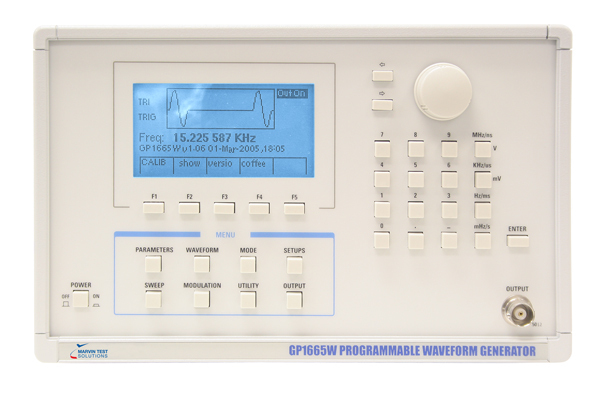 The GP1665W is a programmable instrument capable of generating sine, square, triangle, ramps, pulse, and haverwaves from 1 µHz to 50 MHz. The firmware is customized for the Wavetek 178 command set. Test applications using the Wavetek 178 require no code modification when upgrading to the GP1665W. The GP1665W can operate in a trigger, gate, or burst generator mode at levels up to 20 VPP. It is synthesized to 8 digits in all modes. The main generator produces the sine and square waves, as well as triangles, ramps, pulses, and haverwaves at reduced frequencies. The internal sweep generator varies the main generator frequency linearly or logarithmically between start and stop frequencies. It operates in triggered, gated, hold at start, and hold at stop modes. It also has 10 programmable frequency markers to show critical frequencies within the sweep. The sweep generator can trigger the main generator to produce pulses with a 10 µs to 10 min repetition rate and 5 µs to 5 pulse width. The GP1665W can be phase locked by using an external reference input to lock the reference source. This allows the synthesizer to operate as a variphase generator with phase offset in 0.01° increments. The generator's output level into a 50 ohm load can be programmed from 1 mV to 20 VPP with 3 digits resolution. DC offset can be programmed over a range of ±10 V. The GP1665W also has two external inputs for phase-amplitude-modulation. If phase modulated, the main generator varies ±360° at frequencies above 500 kHz. With amplitude modulation, the output can be modulated up to 200%. Triggered Generator is quiescent until triggered by an external signal, internal sweep signal, GPIB, or manual trigger, then it generates one cycle at the selected frequency. Gated Same as triggered except generator oscillates for the duration of the gate signal plus the remainder of the waveform in progress. Triggered Haverwave Same as triggered mode except output is sine or triangle waveform starting at -90° or +90°. Gated Haverwave Same as gated mode except output is a sine or triangle waveform starting at -90° or +90°. Triggered Burst Same as triggered mode except the number of cycles output for each trigger input is selectable from 1 to 65,536 (216) counts. Triggered Haverwave Burst Same as triggered burst except output is a sine or triangle waveform starting at -90° or +90°. Frequency Sweep Output can be swept by internal sweep generator. Low end frequency for all waveforms is 1 µHz. Main Output 20 VPP into 50 ohm load. Combined amplitude / DC offset waveforms not to exceed ±10 V peak into 50 ohm. Output voltage into an open circuit is double indicated voltage when a voltage less than ±5 V peak is selected. Amplitude Conversion Permits entry and display of amplitude for all waveforms in units VRMS, VPP and dBm. Stability Long term: ±51 x 10-6 / mo. Temperature: ±51.2 x 10-7 / °C. Signal to Phase-Noise Greater than 46 dB in a 30 kHz band centered on carrier, but excluding a ±1 Hz band around the carrier. 500 kHz to 50 MHz. Note: DC offset range is 0 to ±10 V DC. Specified for 1 kHz sine wave or for DC output into a precision 0.1% 50 ohm load. Note: Amplitude and DC offset share the output attenuator. Phase Offset Output phase may be changed from ±1,000 revolutions (±360,000 degrees) in 0.01 degree resolution steps up to 500 kHz and 0.1 degree resolution steps above 500 kHz. Output voltage is double into open circuit when voltage is less than ±5 V DC is selected. Sweep Generator Sweep generator is fully synthesized any may be used independently or for frequency sweeping and triggering the main generator. Frequency sweep may be selected linear or logarithmic, and up or down. Sweep may be triggered, interrupted with hold, and continued with resume. Triggered, gated, and burst are permitted during sweep. Output 0 to approximately +5 V ramp synthesized to 2,000 steps per sweep. 600 ohm output impedance. Frequenct Marker Output TTL levels. One of the ten preset markers can be selected. Output is low whent then main generator frequency is below marker frequency; output is high when above. Log: In addition to the above, any start and stop frequencies with ratio greater than 2. TTL and TTL Sync At generator frequency, 50 ohm source impedance, 50% duty cycle, < 5 ns transition time. Trigger A TTL level transition can trigger or gate both the main generator and/or internal sweep generator. Triggering slope up or down is selectable. Reference An external 0.5 V to 10 VPP sine or pulse clock of ±5 ppm or better stability and accuracy automatically locks the internal reference. External clock may be 1, 2, 3...9 or 10 MHz. Input impedance is 1 K ohm. Amplitude Modulation Rates from DC to 10 MHz minimum. Input impedance is 600 ohm. 5 VPP input gives 100% modulation. Main output halved with no modulation. 200% modulation permitted. Sync output not affected by modulation. Phase Modulation Rates from DC to 10 kHz minimum. Input impedance is 10 K ohm. ±5 V input delivers approximately ±360° shift. Output deviation is ÷100 for main output frequencies 500 kHz and below. Memory Up to 5 complete instrument settings can be stored and recalled from volatile (RAM) memory. Settings may be modified or deleted.